A Surge In Migrant Asylum-Seekers Is Overwhelming System The system is "overwhelmed," says Manuel Padilla, director of Joint Task Force-West. The migrants apprehended at the Southern border in February made for the highest monthly total in almost a decade. 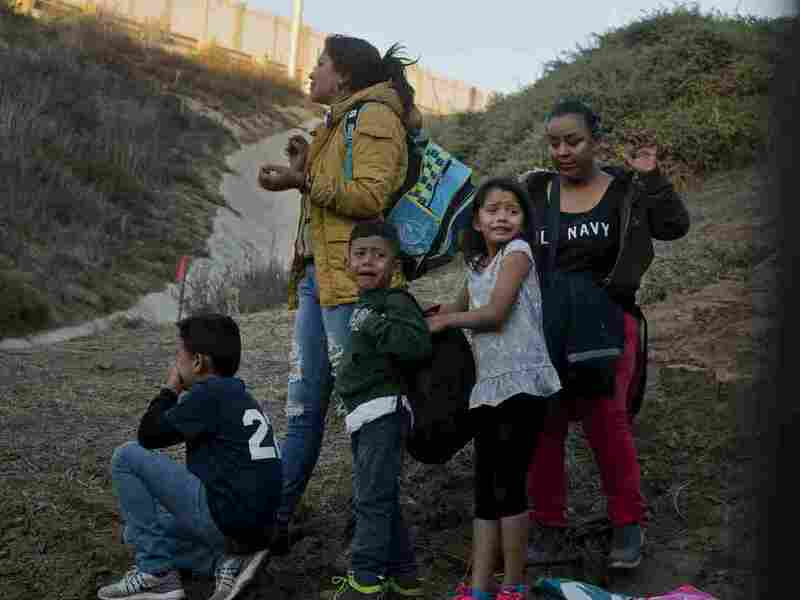 Honduran migrants surrender to the U.S. Border Patrol after crossing a border wall into the United States. According to new federal data, the number of migrants apprehended crossing the border in recent months has surged. This is clearly both a border security and humanitarian crisis. "The entire system right now is at full capacity. Actually, it's overwhelmed," said Manuel Padilla, a veteran Border Patrol agent who's now director of Joint Task Force-West in San Antonio, part of the Department of Homeland Security. Even with the recent climb, illegal border crossings are still well below historical highs. But the makeup of the migrant population has changed dramatically from 20 years ago, when it was mostly single men from Mexico. Border Patrol officials say their infrastructure wasn't designed for the flood of migrant families and children arriving now. "Everything is maxed out and it's causing a lot of issues, because the agents are being assigned to areas that are not border security related," Padilla said, like providing food and medical care for the families and children in their custody. Since last year, Border Patrol agents say, they have routinely encountered large groups of a hundred or more migrants at the border, many of them arriving by bus from Guatemala. According to immigration authorities, the passengers consist almost entirely of families and children who are looking for Border Patrol agents to turn themselves in to. Agents say they've encountered 70 large groups since last year. That leaves agents scrambling to transport and process the migrants, Padilla said, and allows drug traffickers to take advantage of the distraction. Humanitarian groups near the border say the surge of migrant families is straining their resources too. "It takes an immense effort to do this," said Ruben Garcia, the director of Annunciation House, a nonprofit organization in El Paso, Texas, that provides shelter, food and medical care to migrants after they're released from government custody. Most migrants spend just a few days in El Paso, Garcia said, before joining friends or relatives elsewhere in the country, where they'll wait for their day in immigration court. President Trump has decried the surge of people crossing the border illegally from Mexico as "an invasion" — and a chief reason that the U.S. needs to extend its border barriers. So the wall is not going to do anything with this population. This requires a legislative fix. But Padilla, the Border Patrol veteran, believes that a wall alone will not stop these migrants. Many of the migrants are crossing in areas that already have border fencing. And they're not trying to evade the Border Patrol, Padilla said. In fact, these asylum-seekers are trying to turn themselves in as soon as they set foot on U.S. soil. "So the wall is not going to do anything with this population," Padilla said. "This requires a legislative fix." Immigration hard-liners say the U.S. needs to close what they call "loopholes" in the law that allow Central American migrants to avoid quick deportation and that prevent immigration authorities from detaining families for long periods of time. Migrant advocates counter that the Trump administration has made the problem at the Southern border worse by allowing just a few migrant families a day to cross at legal ports of entry. They believe that this is driving many migrants to cross illegally in big groups and in remote stretches of the border. "They're very vulnerable people," said Garcia at Annunciation House. "Let's strive not to lose or let go of our history as a people of immigrants, who are profoundly committed to human rights." Humanitarian groups and immigration authorities are bracing for even more migrants in the months ahead. The number of people crossing the border illegally typically crests in the spring, as temperatures warm.